Loving another as I love myself implies that I become imbued with the desires of another as my own and even more as with my own. Like Bina, I “absorb” his desires with my AHP (Awzen, Hotem, Peh) in order to provide him with everything he desires. This is what love is. This is how a mother loves her child. To love like that, I need to reach the spiritual degree of Bina, having undergone the degree of Hafetz Hesed (exiting, rising above my desires). In the beginning, when a point in the heart awakens in me, I acquire free will, enter the group, and study while remaining in the egoistic intention, Lo Lishma (not for Her Name). Then, I ascend to the first level of altruistic intention, Lishma (for Her Name), which is regarded as Hafetz Hesed. At this degree of Bina, I first obtain the desire to bestow, GE (Galgalta ve Eynaim), followed by the desire to receive in order to bestow, AHP. I rise above the mountain of egoism of the zero, first, and second degrees (GE) and afterwards, over the mountain of egoism of the third and fourth degrees (AHP). Finally, I engage my AHP in order to relate to others as Bina relates to Malchut. At this point, it is a complete intention of Lishma, the spiritual degree of love. Why love? It is love because I am mutually included in the others, absorb their desires, and fulfill them. This is how we start loving others. 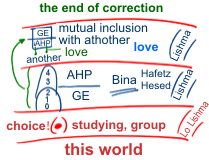 In this love, we find love for the Creator which signifies the end of correction (Gmar Tikkun). Question: If everything depends on the power of thought then why can’t I participate in the Convention while sitting at home on my living room couch in front of the computer screen, with a cup of coffee and a cigarette? Answer: Trust me, I understand you very well since I also like doing that. However, the matter is that I require inspiration. I have to receive an impression from the group. I need a society that’s as strong and as high as possible. I need a goal-oriented, gutsy group, a team, and a mass of people to influence me and turn me into whatever it wishes. Can I receive this impression while sitting at home on my living room couch in front of a computer screen? If the answer is yes, then there’s no problem – go ahead and stay at home. However, we know our nature better than that. A person has to find a place where he can dissolve in society and receive the society’s mind and feelings. Let them replace everything that fulfills my heart and mind; then I am bound to be moving in the direction of the plan of creation. The Creator works with the group, as it is written, “I dwell among my nation.” However, He does not work with me alone. If I become part of the group, then inside it I find contact with the Creator. That is how I reveal His thought (which becomes my thought by virtue of my choice) until I begin to understand and accept His program even before it is actualized. Baal HaSulam talks about this in his article, “Thou Hast Hemmed Me In Behind and Before.” If I connect to the Creator, I gain the opportunity to plan actions as if I am planning them and He carries them out. The Creator gives me this opportunity if I attain His thought. Of course, all of this is a result of love, just like our children control us, their parents. We should always do a realistic, pragmatic check without any illusions to see what nourishes our desires and what means we have at our disposal, while also being aware of their flawed nature and their ability to be corrected. When we have this attitude to reality, we discover that we are between two givens: "I am the first and I am the last," and in the middle we have the opportunity to make a free choice – to attract the force of correction. We attract it according to the principle "we will do and we will hear," or in other words, we unite in the group and during the study in order to evoke the Light that Reforms. Thus we discover that all our states are programmed from Above from the beginning, from the plan of creation, from the adhesion that is planned for the future. The Light causes these states to reach our desire for pleasure and to act inside it in a specific order, from easiest to most difficult. However, we always have the opportunity to choose. Sometimes it is concealed from us that there is none else besides Him. Sometimes we are even in total concealment; whereas, at other times, we choose this concealment for ourselves. That is how we advance: from Him who is the first, through ourselves, and to Him who is the last. At the same time we have to understand that everything takes place only inside the connection or unity of souls. That is where the breaking occurred, and it is also where the Creator awakens the appropriate Reshimot. We have to aim our correction only at this place of disconnection in order to reveal unity precisely there. Thus, I am always doing practical work, trying to unite with the friends and to evoke the general unity. I thereby bring myself and the whole world toward goodness. The first impulse toward this was given to me by the Creator, but afterward, the Light comes and performs the action to the degree I make efforts, revealing the First and the Last in the same point of unity that we attain. It turns out that the goal of our efforts is to love our neighbor as ourselves, and the last step on this path raises us to the degree of love for the Creator. Love for others is the preparation of the Kli, whereas love for the Creator means that He comes last and completes the action. The Book of Zohar influences us with the Light that’s concealed inside it. If we desire to use that Light for our correction, then the only place needing to be corrected is the connection between us. Therefore, each of us should try to imagine where exactly he needs to make corrections. However, we don’t even fully feel yet that our relationships are founded on unfounded hatred and repulsion instead of brotherly love. This quality must transform back to love, and the power of The Book of Zohar is able to accomplish this. Then, inside the renewed connection between us, we will reveal the entire Upper World. We have difficulty understanding the language of Kabbalists. The very subject matter of the discussion is concealed from us, and we don’t know what the Light and Kli (vessel), the Creator and the creature, the spiritual worlds, or the correct and incorrect relationships are. We are unable to compare what is written in the text with reality because spiritual reality is aimed at bestowal and doesn’t exist in our perceptions that are still egoistic. In memorizing the words of Kabbalists, we don’t get to know their essence, but use the clichés that we had previously agreed on. Even if we bring some understanding into them, how do we know that it is correct? After all, the spiritual states that the wisdom of Kabbalah is talking about haven’t left sensations and impressions in us yet. All that we feel in our egoistic desire is not related to spirituality. In order to understand Kabbalistic texts, we need to internally jump over our egoism, freeze in this inner flight, and start absorbing the meaning of their words. This is why we need to shift the words of Kabbalists into the realm of sensory perception. In the World of Infinity, everything is simple: The Light fills the vessel (Kli). However, at the stages of development from below upward, while studying the text without feeling it, it is impossible to visualize what is being discussed, understand, or even mechanically memorize it since we are not undergoing any of what the Kabbalists are describing. As an effect of studying, some ideas are kept in the memory, but since there is a lack thereof in the feelings, we get tangled and lost in them. This continues until we are able to feel the spiritual states being described to the degree of our equivalence with them in our properties of bestowal. This can be achieved solely by way of working with the friends since love of the others leads to love for the Creator. While remaining in egoism, we must first discover our hate in the yearning to be connected with the friends; then, we have to correct it until we have come to love as to a bridge that lies over an abyss of hate. Thanks to this correction, the abyss will be filled with the Light. The group is my copy, my shadow, just as I am the Creator’s shadow. I receive much more from my friends than what I put into them. It doesn’t depend on them or their behavior, but only on my attitude to them. This environment is also the Creator. It is the opportunity He gave me to work with Him, having created an illusion for me as if something exists outside of me while, in fact, only the Creator exists outside of me. If I don’t desire to unite with the group, then I am not aiming at the goal, the Creator at all. After all, who is my neighbor? The force of the breaking that took place in spirituality divided me into two parts: me and my neighbor. What for? It was in order for me to discern what I lack in order to unite with the Creator. That is why “love your neighbor as yourself” is the main rule of the Torah. This is the only thing the Light corrects, and there is nothing to correct but this. If you don’t ask for this correction, then all your efforts are wasted. Everything else is useless cries into the wilderness. “Love thy neighbor as thyself” is the sentence that determines the whole principle of the connection between desire and the Light, the correction of the common soul. In order for the creature to be able to reach equivalence to the Creator, the Creator is forced to first break the creature and bring it to hatred, to a state that is opposite to Him. Achieving a state that is opposite to the Creator is only possible by creating a creature that is similar to Him and then changing this state to the opposite so that an imperfect form would arise from a perfect one. Thereby, the creature is presented with an opportunity to reach equivalence to the Creator on its own from an imperfect state by scrutinizing its own qualities and those of the Creator: What does it mean to be perfect and how does one reach this perfection. The creature is searching for a solution, and in this manner it achieves the Creator’s state. In the process it obtains freedom to decide by choosing equivalence as the only perfect state. It is impossible to understand how one can be free from one’s nature. However, under the influence of the Light, which is opposite to our nature, a neutral space is created in our desire, which is absent even in the Creator. And precisely that which will develop in this neutral space will be called the created being. We ourselves build this creature, the human being, “Adam,” which means “similar” to the Creator.